The week began with the faces of the "Dear Leader" and his “Great” father, in a circle, on a red background, with nothing else. The late North Korean leader Kim Jong-il and his father, Kim Il Sung, are omnipresent on North Korean state television. It is as if the channel warns its viewers: This channel is of the Kims, by the Kims and for the Kims. My ABC News colleagues and I in Seoul spent all last week watching the communist state’s broadcasts — from Jan. 22 to 26 – to get a glimpse into the average North Korean TV viewer’s mind. By the end of the week, we had become fans of an animated North Korean measuring scale and were humming propaganda songs praising communism. 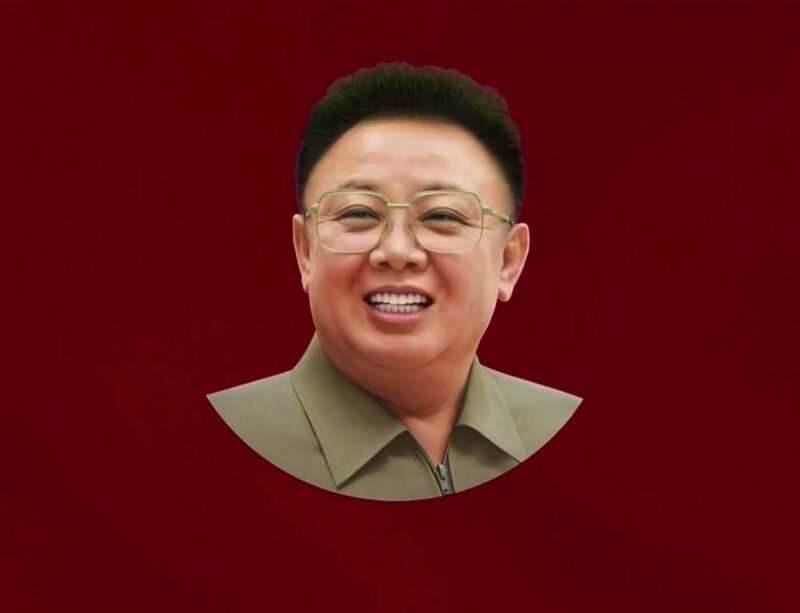 An image of the late North Korean leader Kim Jong Il appears before the daily broadcast on Korean Central Television. Korean Central Television (KCTV) is the most active operating TV channel in the North, and it transmits programming for just seven hours every weekday. Other channels, like Mansudae TV and Korean Educational and Cultural Television, only operate for a few hours due to the North’s lack of electricity and economic reasons, according to An Chan-il, a North Korean defector who is now head of the Seoul-based World Institute for North Korea Studies. On KCTV, daily broadcasts commence at 3 p.m., with a simple schedule of the day’s programming. To watch North Korean television in the South, you need a satellite dish set up specifically to receive it. ABC News has one, and other journalists in Seoul monitor the broadcasts, too. The typical South Korean doesn’t have the ability to watch the broadcasts. Each Korean Central Television broadcast begins with a look at the day's schedule. News reports take place twice daily, and the duration varies according to the amount of “news" the channel is capable of scraping up. There’s not only news, but documentary films, inspection reports on new factories, animations for children and occasional art movies to improve North Koreans’ cultural literacy. Watching from Seoul, it’s interesting at first to compare the broadcasts to South Korea’s wide variety of programs. But the repetition of the nonstop heroic portrayals of Kim family members throughout the day grows tiresome. 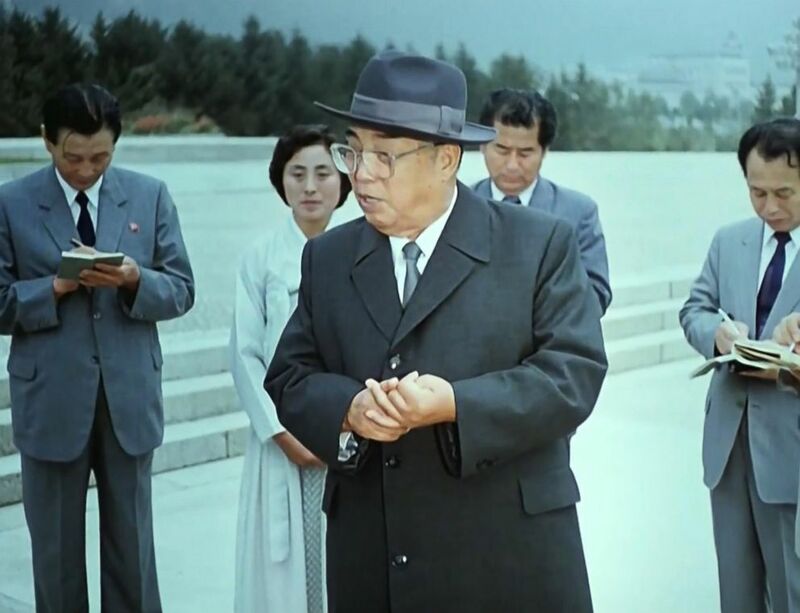 The late North Korean leader Kim Il Sung is shown during a documentary film honoring his achievements, on Korean Central Television. I began to get the feeling the network had no consideration for what the viewer wished to see. “There is no need to consider the viewer’s preference because KCTV has no competition,” An said. 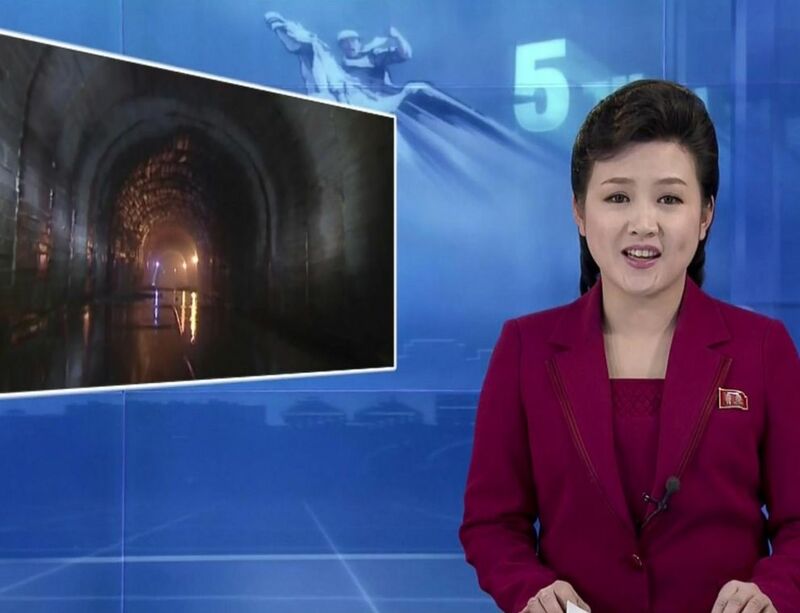 Watching KCTV’s news twice a day, we witnessed only the technological developments North Korea wished to share with the public. The news reports followed a familiar pattern: They usually started by praising Kim Jong-un and noted how foreign countries showed respect to the “Great Leader.” At some point, it would shift to reprimanding the United States, directly or indirectly; throughout the week, six total minutes were devoted to criticizing America. Seven minutes throughout the week were devoted to introducing collective farms and discussing how tons of manure were ready for cultivating in the spring. And then there were a variety of reports on factories—13 minutes total, including a nine-minute report on the medicine factory Kim inspected on Friday. 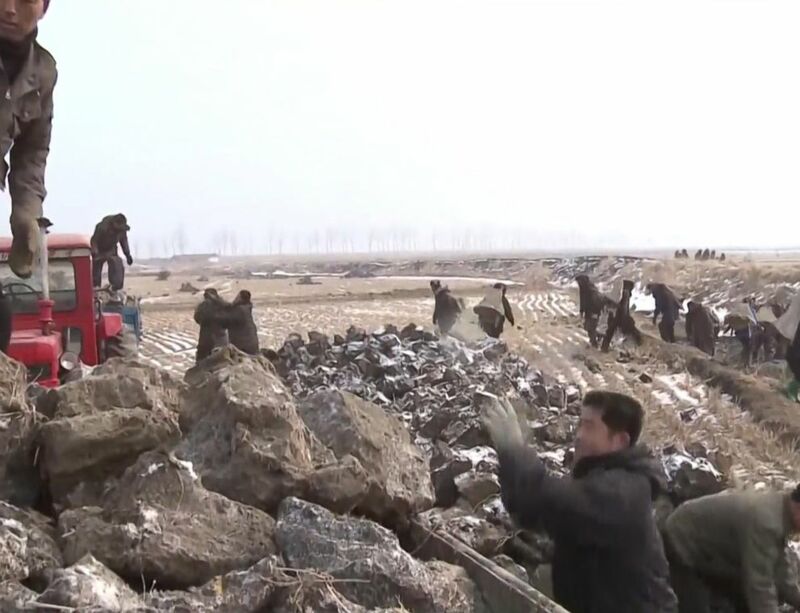 Korean Central Television shows workers handling manure, a common theme during the channel's broadcasts. The anchor would often brag about factories achieving record-breaking production rates. Interviewed workers were glad to carry out the directives of Kim's New Year’s address, when he urged North Koreans to invigorate the overall economy. More than anything, it was amazing how hard collective farms around the country worked to produce manure. In just one week, North Korea already had a collective farm in Anbyeon, Chungwoon, Uiju and Shinuiju that had finished preparing manure for the spring season of farming. Not to mention manufacture factories that created the best quality goods — all type of goods — for the people. In a sock factory, laborers passed down the know-how of maneuvering factory machinery. This is “news" in North Korea. A Korean Central Television anchorperson spent nine minutes reporting on North Korean leader Kim Jong Un's visit to a medicine factory. And if Kim visits a facility, which is considered a great honor for those who work there, the news proudly puts it as the top report of the day. On Thursday, the newsreader talked about how the “Revered Supreme Leader Kim” supervised the Pyongyang Medicine factory with his wife. 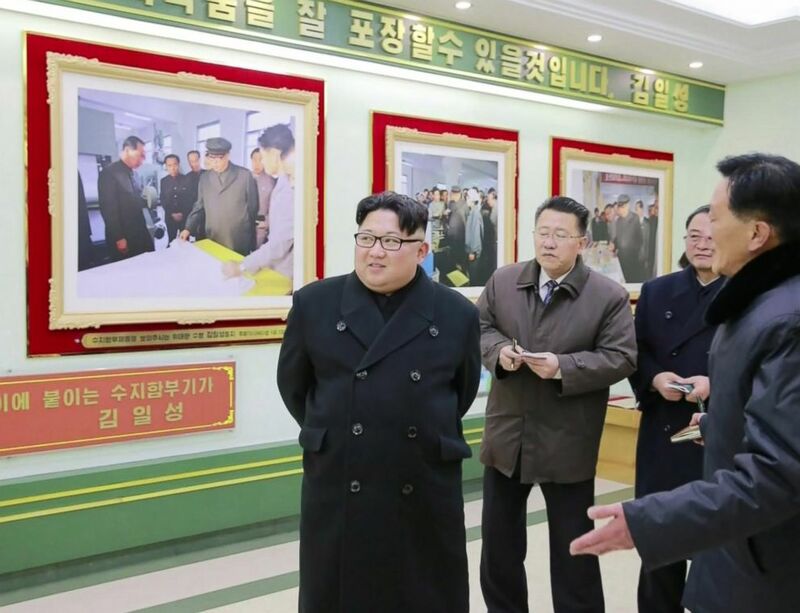 Only photographs were shown as the anchor explained how Kim motivated the workers to achieve quality and modernize factory facilities to produce better medicine. For a citizen of North Korea’s capital Pyongyang, North Korea might seem like a very prosperous nation. Renewable energy plants light up the picturesque Pyongyang sky, state TV says. A teacher’s college nurtures future instructors with state-of-the-art facilities, according to the newsreader. And of course, no one suffering from famine or the infringement of their personal rights are anywhere to be found. 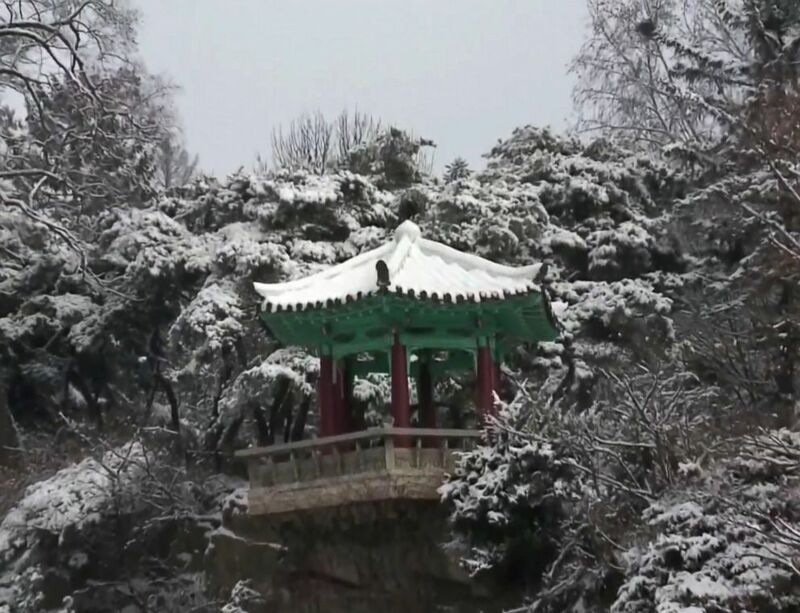 Picturesque scenery is shown between programs on Korean Central Television. The world knows very well how North Korea has been condemned for human rights violations. We know that the communist country that pretends to be so wealthy in its own broadcasts has actually asked for food and financial aid from abroad. “When the broadcast reports that productivity is growing, there’s high chance that the report is fabricated,” An, the North Korea expert, said. "They report what Kim wants to hear." 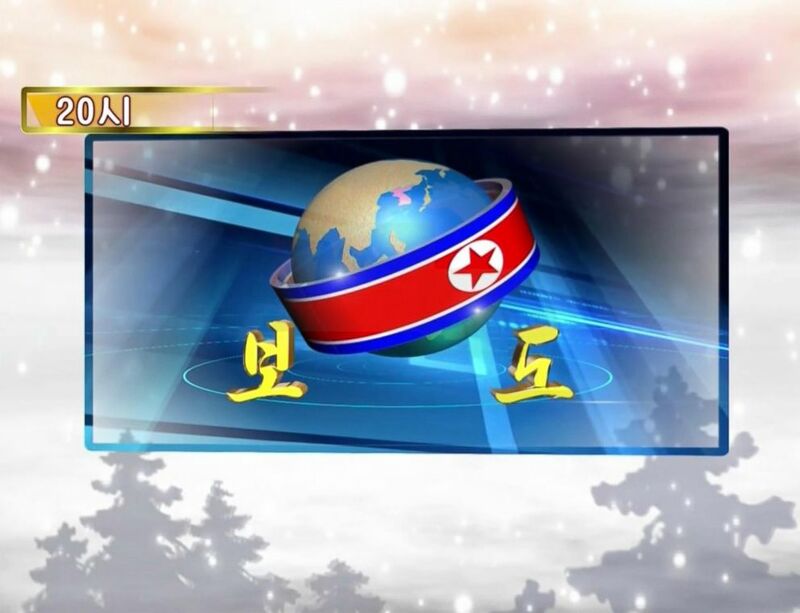 KCTV does its best to make people follow the party’s socialist system and grow their faith in Kim. “Let’s fight against imperialism,” the channel regularly intones. “The great general’s unique socialism prospered the nation." An anchorperson wears a traditional Korean dress called a "hanbok." News reports begin with a bow. North Korean TV has no hesitation in slandering other countries. 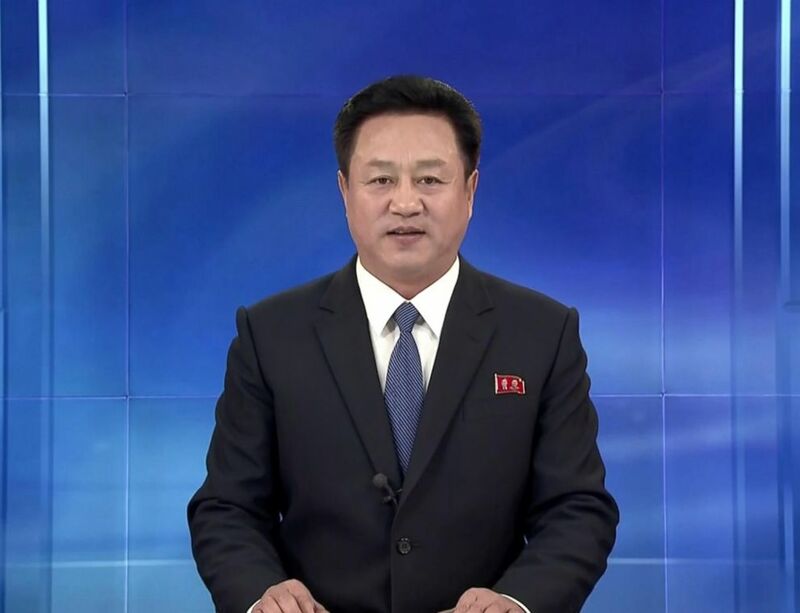 One anchor of the main news broadcast, which takes place at 5 p.m., criticized the United States for what he called its mischief-making and for allegedly hindering reunification in the Korean Peninsula. 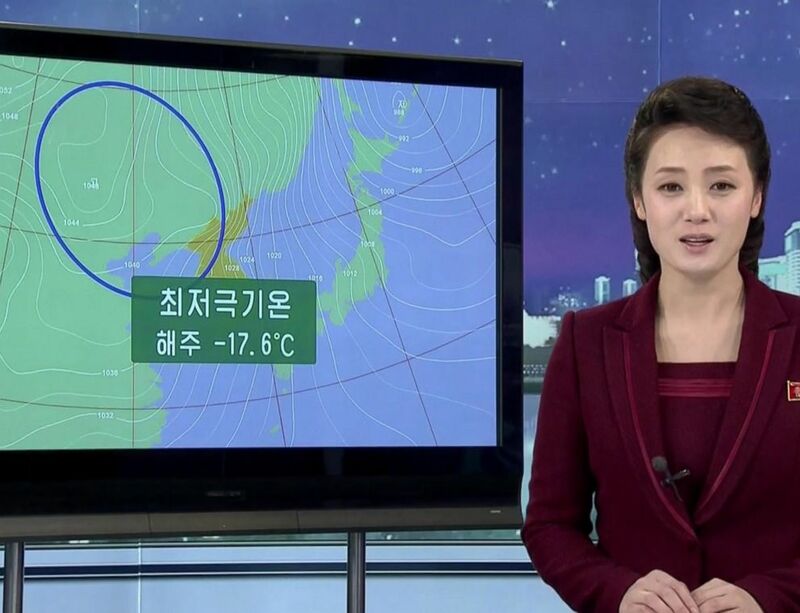 A weather report on Korean Central Television. North Korea always plays the victim. In the world of KCTV, North Korea is an abused boy in high school who stands in a lonely fight against the school bully, otherwise known as the United States. Its news and documentary films describe foreign countries as enemies that attempt to hinder the existence of the communist state. Last week’s reports emphasized how the United States was a threat to relations between North and South Korea. That spin came as the two countries met along their shared border to discuss the North’s participation in next month’s Winter Olympics in Pyeongchang, South Korea. 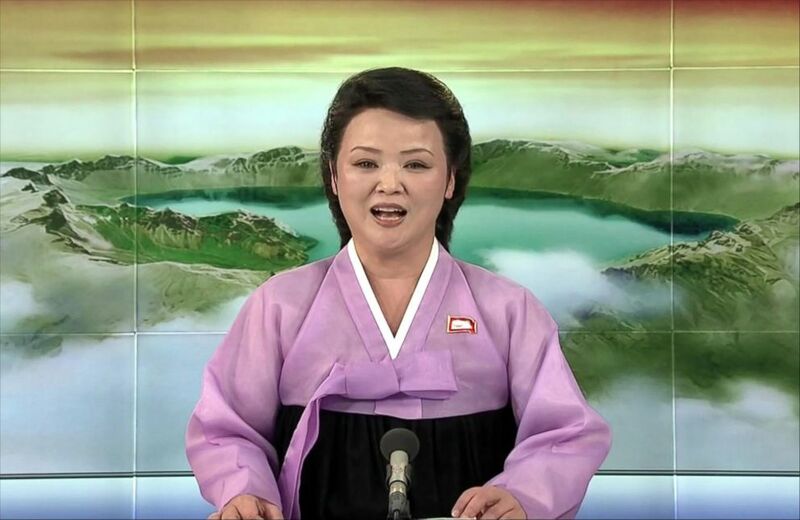 An anchorperson on Korean Central Television wears Western style clothes and speaks in a confident tone. The anchor went so far to read a “declaration” toward South Korea on Thursday — for 15 straight minutes, with no videos or photos to keep the viewer engaged. In that report, KCTV referred to Pyongyang’s nuclear power as a “means to keep United States’ increasing interventions under control." We did not hear a single compliment of a foreign country in the entire week. Instead, the news reported on various tragedies taking place around the world. On Monday, KCTV noted that the U.S. government was facing a shutdown and that people were protesting against President Trump. 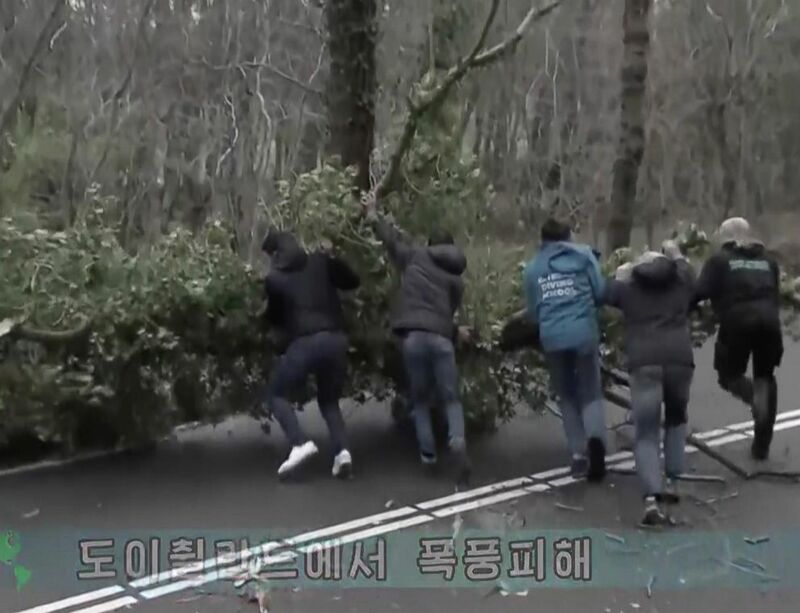 Korean Central Television shows images of what it says is "storm damage in Germany." “People in many countries have lost their lives due to the highly infectious flu. Citizens from many countries including China, Hong Kong, Macao, Pakistan, Ireland, Japan, Canada, Albania, Germany, U.S. and Tunisia have suffered from the disease,” according to Tuesday's broadcast. In KCTV’s telling, countries abroad are suffering from war, corrupt government officials and disease. The anchor speaks with a confident, credible tone, assuring viewers that the channel is delivering nothing but truth. The broadcasts try to persuade North Korean viewers to believe that foreign countries are horrible places to live and that they should appreciate their supposedly fortunate lives in North Korea. An anchorperson on Korean Central Television wears a Western suit and speaks in a confident tone. While there are no commercials between shows, the breaks are filled with propaganda music. Frankly, these songs are quite good. North Korea has some very gifted musicians and singers. On Tuesday, a music video for the song “Guard the Central Party with Life” showed off military scenes and the national flag. As its title suggests, the song’s lyrics stressed the need to give one’s life—if necessary—to protect the Central Party Committee. “The people’s army,” it said, is “nurtured in the arms of the Worker’s party.” “Comrades’ red blood,” it added, is "dedicated to the party. Soldiers in the video seemed to be proud of their situation. What’s left out is any mention of the four North Korean soldiers who defected to the South last year. 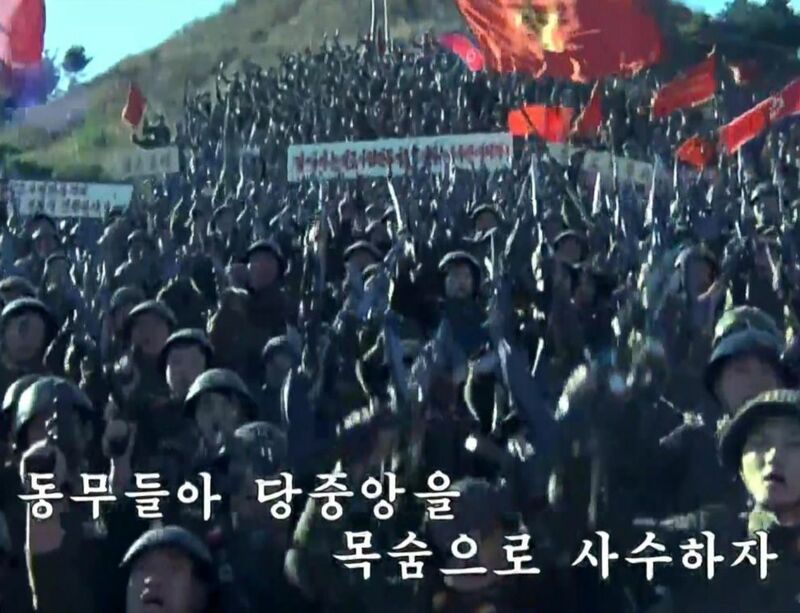 Korean Central Television airs the propaganda song, "Guard the Central Party with Life." The tunes are catchy and the lyrics are short and to the point, making it easy to sing along. They’re either military-like marching songs or have folksy melodies, so even if you're hearing them for the first time, it feels like you’ve known the song since you were young. And there’s karaoke! Kind of. Song lyrics that appear in the bottom part of music videos enable viewers to sing along, or at least read along to propaganda. The catchy melody is a bonus. The somewhat-familiar melodies linger in the viewer’s head. The superb scenic beauty of North Korea’s untouched nature and the polished Pyongyang city views appear on screen for much of these songs, showing how desperate these channels are to imprint in their viewers’ minds that they're living in the most beautiful country in the universe. And lest you forget, Kim’s humane qualities are portrayed throughout the videos, showing him smiling and waving to the people. Subtitles help viewers sing along to propaganda songs on Korean Central Television. "Comrades, risk your lives to guard the Central Party," one song implored last week. 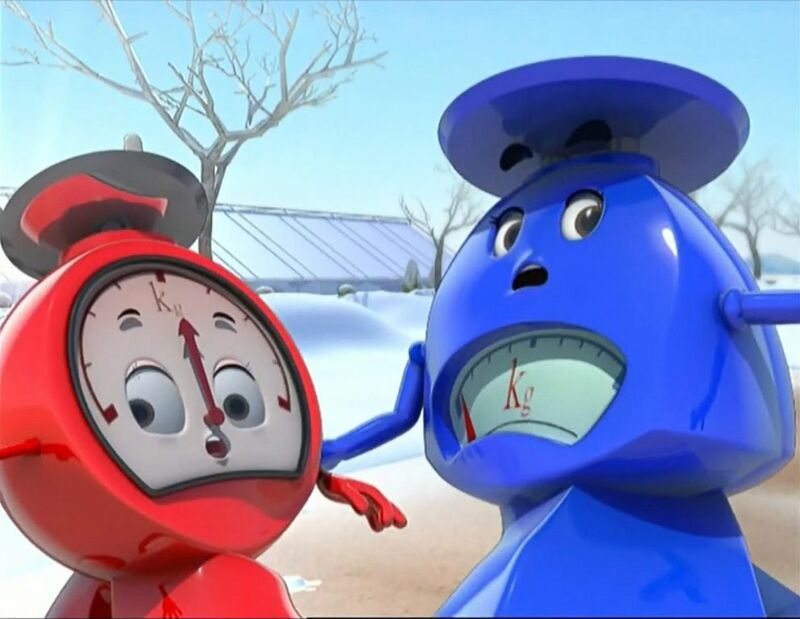 KCTV spends an hour every day on a children’s movie. But even a children’s film is full of instructive intentions, and they're often very straightforward. Watching from the South, we felt like we were taking a step back into the 1980s. Decades-old animation techniques would send 3D robots running across the screen and lead to outdated graphics frequently popping up. On Monday, the channel ran a cartoon called "Keep in Mind." It was about a cavity growing inside a child’s mouth. The maxim of the cartoon was to brush your teeth well to prevent cavities. Tuesday’s cartoon film was even more educational. "The Story of Scale Brothers” was a perfect example of a film designed to encourage people to carry out Kim’s New Year's plans. The cartoon personified scales, a flask, and a microscope—giving us hope that the cartoon might actually turn out to be funny. 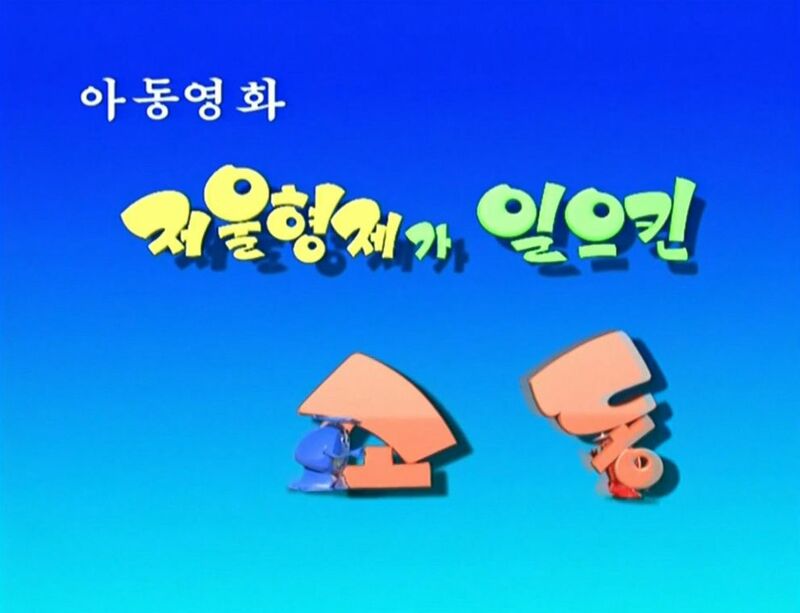 Children's cartoons employ graphics that remind South Korean viewers of the 1980s, like during the title sequence for the show "The Story of Scale Brothers." To my dismay, the “Scale Brothers" began introducing their prosperous bean farm. They showed off warehouses full of soil, pesticides and manure, ready to start farming in spring time. The cartoon resembled the 5 p.m. news, albeit with cartoon tools. The "Scale Brothers" are the personified protagonists of an animated children's cartoon on Korean Central Television. One day on the “Scale Brothers,” the brothers received a call from “Dr. Microscope,” who promised to send them seeds that could be cultivated during winter. A flask arrived with fungus, so the Scale Brothers became angry and locked him up in a storage house. In the end, the brothers realized that the “fungus" they underestimated could, in fact, create mushrooms. It was a happy ending where everyone learned how to grow nutritious and delicious mushrooms during the winter, requiring no light, no pesticides and—wait for it—no manure. For a 25-year-old who grew up watching “The Powerpuff Girls” and “Jimmy Neutron,” I couldn’t help but feel sorry for the children living in Pyongyang. Cartoons can be so much more fun. ABC News’ Yejin Jang, Sang-un Youn and Jaesang Lee contributed to this report from Seoul, South Korea.